A new isostatic residual gravity map of the northwest corner of Utah is based on compilation of preexisting data and new data collected by the Utah and United States Geological Surveys. 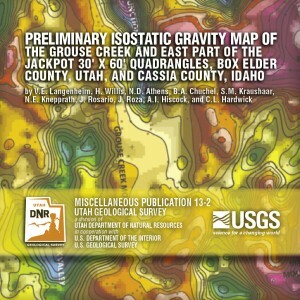 Pronounced gravity lows occur over Junction, Grouse Creek, and upper Raft River Valleys, indicating significant thickness of low-density Tertiary sedimentary rocks and deposits. 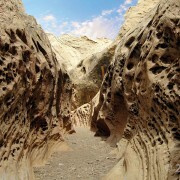 Gravity highs coincide with exposures of dense pre-Cenozoic rocks in the Raft River Mountains. Higher values in the eastern part of the map may be produced in part by deeper crustal density variations or crustal thinning. Steep linear gravity gradients coincide with mapped Neogene normal faults near Goose Creek and may define basin-bounding faults concealed beneath Junction and Upper Raft River Valleys.